Argh! Ahoy ye mateys, hoist the mainsail and scuttle the jib. We be plundering booty even if it means sinking to the bottom of Davy Jones’ Locker. We’ll be honest…that didn’t make a lot of sense to us. However, if you’re a fan of talking like a pirate, or just yelling, “g’yaaarrr” at people, then it’s safe to say you’ll love the Billy Bowlegs Pirate Festival in Fort Walton Beach, Florida. A long-held tradition, this annual event is beloved by kids and those who are still kids at heart all throughout the Destin, Fort Walton Beach, Okaloosa Island area. People even travel from around the country for all the festival has to offer, including plenty of delicious food, live music, arts and crafts, family-friendly activities, and costume contests. Plus, a gigantic fireworks show and the Torchlight Parade ensure everyone leaves the festival highly entertained. After you’ve sampled some of the best local food our area has to offer, and once you’ve finished playing the games, dancing to the music, and seeing all the incredibly detailed costumes, there’s still so much to do in the Heart of Florida’s Emerald Coast. Relax on our world-renowned beaches, featuring iconic sugar-white sand and glistening emerald-green waves. Indulge all the senses with breathtaking views at waterfront restaurants serving the freshest Gulf-to-Table seafood you’ve ever tasted. Take an outdoor adventure with hiking, paddleboarding, boating, snorkeling, and much more. And, enjoy some of the world’s best fishing in Destin, “the World’s Luckiest Fishing Village.” Also, with more than 13,000 rooms available across a variety of accommodation types on and off the beach, you’re sure to find the perfect place to call your home away from home. 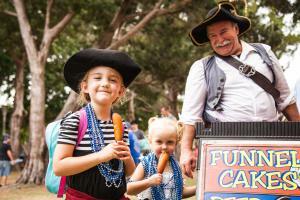 So, grab your treasure maps and Jolly Rogers, and say, “Ahoy” to a pirate festival the whole family will love. The Billy Bowlegs Pirate Festival is held Friday May 31 and Saturday June 1, and the Torchlight Parade is on Monday June 3. Get all the information on the festival here.